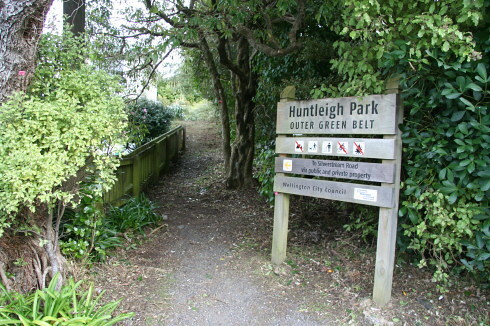 There are a number of wide, well formed tracks through the Huntleigh Park park bush area above the Guide hall in Silverstream Road. I have only mapped one possible track down, there are a number of tracks but most end up in the same place at the bottom. I begin the description from the small entrance near 28 Huntleigh Park Avenue. This is a small no-exit road in the suburbs of Ngaio. The track is well maintained with proper bridges and steps. About 100 metres into the bush there is a track going uphill to the right. This exits the bush via a stile (see also the Bulldozer track) and continues up to Crows Nest. Continue left/downhill. The track zig-zags a little, but eventually emerges near a small stream near the Girl Guides Huntleigh buildings on Silverstream Road beside an adventure play area. Walking from Ngaio to Huntleigh Park way, or from the back of Silverstream play area.